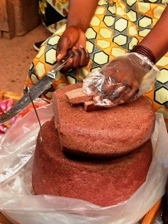 This brown cake-like object is "African polony". This object tastes like a sweeten sausage. 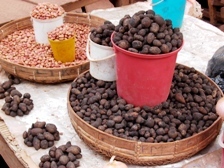 Africa has mysterious foods which we never know. These pebble-like plant's roots (chikanda) are the main ingridient for the African polony. One amount of the roots costs 30,000 ZMK (=8 USD). It is expensive!